One of the most distinctive features of esoteric Buddhism is the Mandala. Buddhism generally speaks of the person as consisting of body, speech and mind. The Buddha also has three aspects, although these are esoteric rather than mundane. The three aspect of the Buddha are known as the triguhya or three mysteries. These three mysteries correspond to the three aspects of the person. The mysteries of body, speech and mind in the ordinary person correspond to mudra, mantra, and mandala for the Buddha. So mandala represents the mind mystery of the Buddha. There are many different mandalas, varying across time and text. Each however shares certain features. Mandala literally means circle, and Buddhist mandalas are typically in the form of a circle, or contain as a main feature an encircled area. At the centre of the mandala is the figure of a Buddha - who may be represented as a person, a symbol or a syllable. Surrounding the Buddha will be a number of other figures. If the Buddha in the centre of the mandala represents the cosmic principle of Awakening, then the other figures represent some aspect of Awakening. We usually think of the five fold mandala - with a central Buddha surrounded by four other Buddhas - as being distinctively Buddhist. Early mandalas used a three fold symmetry. The five fold mandala emerges only in the 7th or 8th century in texts which the Tibetans call Yoga tantras. However I have discovered another five fold mandala in an unexpected place. Brhadaranyaka Upanisad III.9 describes the gods and their supports as occupying the centre and the four compass points: Agni occupies the centre, with Soma, Aditya, Yama, and Varuna occupying the north, east, south and west respectively. The list appears in a longish discussion between Yajnavalkya and Vidagdha Shakalya about how many gods there are. The Brhadaranyaka Upanisad is considered to be pre-Buddhist partly because the Buddha of the Pali Canon quotes from it, and satirises it in several places, e.g. the Tevijja Sutta, DN 13. I think we have here a clear precedent for the type of mandala which becomes important in Buddhism many centuries later. This should come as no great surprise as we know, and I have tried to highlight this in my blog, that Indian religious traditions are quite free in adopting and adapting the practices and ideas of their 'competitors'. What does this tell us about the origins of esoteric Buddhism? I think the best way to view esoteric Buddhism is that it was a grand synthesis of many religious traditions, with Mahayana Buddhism providing a framework, that occurred in the mid 6th century as a response to the socio-political and religious needs of the times. The fact that we find precedents may not be significant in determining the time of birth for esoteric Buddhism for this reason. To speak for instance of an Upanisadic mandala, or a Mahayana dharani as proto-tantric seems to create the wrong impression of the process. Sawn timber is not a proto-table for instance. Professor Ryuchi Abe makes a similar point in his discussion of the introduction of esoteric Buddhism to Japan. Yes, many elements later incorporated into esoteric Buddhism existed before Kukai arrives back from China in 806. However Abe argues that there was no conception of "esoteric" Buddhism, no esoteric context in which those elements could exist. Buddhism in Japan up to 806 had been Mahayana Buddhism despite the widespread and frequent use of dharanis in ritual, and even translations of esoteric texts. Without the esoteric teachings such artefacts could only be interpreted through the lens of Mahayana Buddhism. This is further born out in several of Kukai's earlier works in which his main aim to establish the esoteric teachings as valid - Benkenmitsu nikyō ron, The difference Between Exoteric and Esoteric Buddhism, being one of the more important texts. 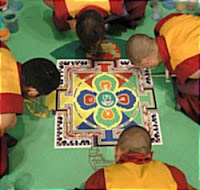 So Mandalas are quintessentially Buddhist, but have a history which pre-dates their use in esoteric Buddhism. Context is important in understanding any aspect of Buddhism. Huntington, John C. 1987. Note on a Chinese text demonstrating the earliness of tantra. JIABS 10 (2) p.88-98. Lately I have been pondering the mandala of the five Jinas. Something was puzzling me. Amitabha and Akshobhya represent a set: compassion and wisdom. Vairocana clearly is a development of the Buddha. Early tantras have a trinity of Amitabha, Shakyamuni, and Akshobhya. Wisdom and compassion are clearly the two most salient features of a Buddha and it makes sense to represent them as individual Buddhas. However the tantras introduced a set of five Buddhas, which by about the 7th or 8th century CE had settled down into Akshobhya, Ratnasambhava, Amitabha, Amoghasiddhi, and Vairocana in the centre. Clockwise from the east which is at the bottom in the image. So where did Ratnasambhava and Amoghasiddhi come from? This is something of a mystery. The standard texts such as Snellgrove's Indo-Tibetan Buddhism note the appearance of the pair, describe them and then move on. There is nothing about the process, nor about why they make a pair. Do they make a pair? Ratnasambhava is in the south, is golden yellow, is lotus throne is supported by horses, his mudra is the varada or giving mudra, and his emblem is the jewel - his name means Jewel Born. He is associated with the sun at midday. Ratnasmabhava's wisdom is the wisdom of equality which sees the that everything has the same nature, which is the nature of Shunyata. Amoghasiddhi is in the north, is dark green, and his lotus throne is supported by shang-shang birds (these are garuda birds with human torsos and heads who play cymbals.) His mudra is the mudra of fearlessness and his emblem is the crossed vajra. In Sanskrit it is vishva-vajra, where vishva means something like "on all sides". Amoghasiddhi's wisdom is the wisdom of fearlessness. The Buddha kula that he presides over is known as the action family and his name means Unobstructed Success. The breakthrough in understanding this pair came while attending a communication course with Locana. Over simplifying a bit, the model of communication and connection that Locana was describing begins with observation. Feelings arise from these observations. These feelings connect us with, and flag up, our values or needs. And out of this we move into action, or we make a request. The details are not important, but what struck me was that three of the steps in the model - observation, feelings, and actions - could relate to three of the Buddhas in the mandala. Obervation is intellect, but also brings to mind the mirrorlike wisdom which sees things just as they are. Feelings are obviously connected with red Amitabha's compassion. Action as I just mentioned were the concern of Amoghasiddhi. What was left out was values. The values, or sometimes needs, that are referred to are universal human values that we can all understand and connect with. They are the key to understanding conflict and connection. And it struck me that values is what Ratnasambhava corresponds to. The jewel that Ratnasambhava holds is the cintamani, a symbol for the Bodhicitta. This is surely the highest value of Buddhists. We value Awakening as the most value thing. Generosity is the most fundamental virtue in Buddhism, which is to say that we value it highly. Generosity is sometimes seen as the best practice for lay people, whereas Awakening is the goal of serious practitioners. Generosity builds us merit which will a lay person to be born in fortunate circumstances, i.e. in circumstances where they can practice seriously and Awaken. In a mundane sense Ratnasambhava represents wealth. One of the main Bodhisattvas of his kula is Jambhala who holds a mongoose which spews forth jewels when squeezed. So yes, this does seem to fit. Sangharakshita has associated Ratnasmabhava with beauty and art. I think this is covered by the idea of value. Beauty is the object of aesthetic appreciation, and paying attention to beauty, according to Sangharakshita, helps to refine our senses. Refining our senses can help us to make progress towards experiencing more refined states of mind. Finally great art can help to transform our lives by inducing in us a reflection of the inspired state of the artist. I suspect that Amoghasiddhi came first however. In the early tantra there were three Buddha kulas. At around the same time a group of three Bodhisattvas appeared in Buddhist art. Avalokiteshvara, Manjusri and Vajrapani represented compassion, wisdom and energy. The word translated as energy is virya. Virya is energy in pursuit of the good, ethical energy. It is energy directed towards Awakening. Amoghasiddhi is the Buddha of action, and this action is motivated by, and directed towards, the good. And the good is represented by the jewel held by Ratnasmabhava. So yes Ratnasambhava and Amoghasiddhi do represent a pair. Another observation has occurred to me in the last few days. Ratnasmabhava is a solar deity, he is associated with horses, is associated with giving, and is associated with art, beauty, and inspiration. Now there is another Indian deity who shares these characteristics and that is Agni. Agni is one of the old Vedic gods whose worship is outlined in the Rigveda. The word agni is cognate with ignite, and he was associated with the sacrificial fire, but also anything which burned including digestion, and the sun! So Agni is synonymous with the sun. The largest and most elaborate sacrifice in the Vedic calendar was the horse sacrifice - which is described in the first book in the Rigveda. Finally it was through possession by Agni that the Vedic sages were able to give voice to the ecstatic inspired hymns which make up the Rigveda. He is the source, the spark, of imagination and poetry - the highest art of the Vedic period. This kind of absorption, if I am right, should come as no surprise. This is what the history of Indian religion is like. Buddhism adopted and absorbed deities from the earliest times, so that Indra is a frequent character in the Pali Canon for instance. The five Buddha mandala is a feature of esoteric Buddhism, which is itself a grand synthesis of seventh century Indian religion. image by Aloka from the Padmaloka website.